Convert Visual Studio setup projects to WiX. 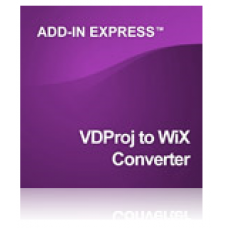 VDProj to WiX Converter is an extension for Visual Studio that lets you quickly convert your existing Visual Studio setup projects to WiX (Windows Installer XML). All features of Visual Studio and WiX setup projects, all project types and built-in dialogs, all variables and searches, files and registry entries, resources and prerequisites are supported. Right-click on your setup project in the Visual Studio Solution Explorer and select "Convert to WiX project". A new WiX-based setup project is automatically added to your solution. The new WiX setup will be an exact replica of your old Visual Studio Installer project. It will automatically add all custom actions, registry settings and launch conditions to the WiX source file (.wxs). All you need to do is build your new WiX setup project and you're ready to deploy. Life-time developer license, run-time royalty free.